Adam Loewen has given up pitching but his hitting is just fine as he leads the Fisher Cats past the Dogs. Portland recovers from a 3-0 deficit to beat Harrisburg 7-4 and improve to 39-38. On the day the all-star teams are announced, Portland falls behind early in an 8-4 loss at home. Portland picks on New Britain's bullpen for the second game in a row and earns a 9-5 victory. Sea Dogs first baseman Anthony Rizzo has the tools to become a premier power hitter in the majors. Portland overcomes a 5-1 deficit with six runs in the seventh inning to snap a five-game losing streak. 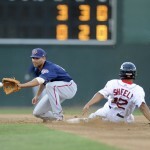 Portland's losing streak reaches five games after New Britain squelches a seventh-inning rally. After getting three runs in the first inning, Portland fails to hold off Altoona, which completes a sweep. Altoona spoils strong Portland pitching by coming up with a late run for a 2-1 victory.